Adam Bozeman's world ended when he was informed his lover had been killed in a shooting. 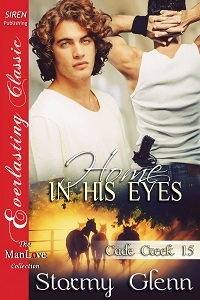 Unable to get over his heartache, he decides to go home to Cade Creek. But his misery only grows worse when he discovers his lover alive and well and living in his hometown. Before he can deal with the betrayal he feels at being lied to, he has to make sure Mike stays alive. DEA Agent Mike Ryan spent months in Cade Creek recovering from a bullet wound from a botched mission and a broken heart from being dumped by his lover. Coming face to face with Adam changes the betrayal he feels into confusion. Someone is trying desperately to keep them apart and Mike is determined to find the culprit. Learning to trust each other again seems simple compared to trying to keep each other alive when the bullets start flying. But Cade Creek is a close-knit community and they don't take kindly to someone going after one of their own. When trouble arrives, Adam and Mike learn they have the support of more people than they thought.